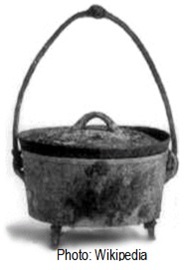 This is a vintage American cast-iron Dutch oven from 1896. I would imagine the early settlers in log homes would hang this from their fireplace to cook up a hearty rabbit stew. The best cast-iron cookware is made in the USA for me. Cast-iron pots and pans are made in a variety of cookware and in Asia, predominantly in Japan, Korea, China, and India. The history shows long cooking with cast-iron containers, pots, and bowls. Cast-iron has been highly valued for its ability to withstand heat of a fire and its durability. Before the invention of the kitchen cook stove, those in the USA and Europe cooked meals in the hearth of the fireplace designed for that purpose around the middle 1800s. The cast-iron pots had legs to stand in the fire and a handle to hang from a hook at the top. During the late 1800s, flat bottoms and the first cast-iron skillet came into production with the advent of kitchen stoves to cook on. The first stoves used wood as fuel. 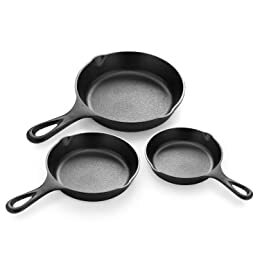 Cast-iron cooking pots and pans with legless flat bottoms came into use when cooking stoves became popular; this period of the late 19th century saw the introduction of the flat cast-iron skillet. I still have my grandmother’s Wagner Ware manufactured in 1881. She passed it on to my mom and she then gave to me. Lodge® started producing cast-iron cookware in 1896 and is the best and most popular cookware and it’s made in the USA. Everyone had cast-iron up until the mid-1950s. Then we began to see the popular enamel-coated cast-iron cookware along with Teflon® and other non-stick interior surfaces along with stainless-steel and poorly made cheap aluminum pots during 1960 and 1970. However, the durability and reliability of cast-iron as a cooking tool has ensured its survival. Lodge®, Wagner and Griswold cast-iron pots and pans from the 19th and 20th centuries continue to see daily use to the present day. They are also highly sought after by antique collectors and dealers. 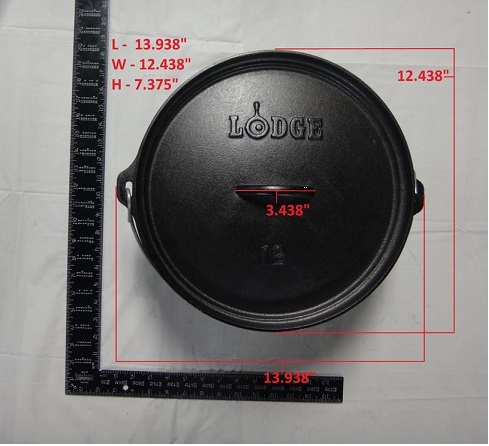 The Lodge® Manufacturing Company is currently the only major manufacturer of cast-iron cookware in the United States, since most other cookware suppliers use pots and pans made in Asia or Europe and mostly in China. Seasoning is not salt, pepper or spices! Seasoning your skillets and other cookware is done with oil and is not difficult to do. The cookware comes to you pre-seasoned but will need to be redone after cooking each time. After washing in hot water as shown in my article, How to Clean Cast-Iron Skillets, you will feel confident in doing this yourself. Seasoning prevents the cookware from rusting and lets the food cook to be easily removed. You use a thin layer of vegetable oil and put it in the oven at 350-degrees F. for 30- to 60-minutes. Be sure the skillet is clean and dry first. When your cookware is seasoned, it helps acidic foods such as tomatoes, beans, and citrus from reacting with the iron of the pan. Acidic foods will remove the seasoning so be sure to do it again after you’ve cooked tomato sauce for example. It is recommended to maintain the seasoning frequently to keep the food from sticking to the iron. Enamel-coated cast-iron pans do not need seasoning, since the enamel coating prevents rust in most instances. These pans and skillets need to have butter or oil coated on the interior when frying and cooking though. To help you choose your cookware, please read my cast-iron cookware reviews below. I wrote an article about the easy-to-do cleaning process shown here. A video is attached to it so you can see the demonstration. 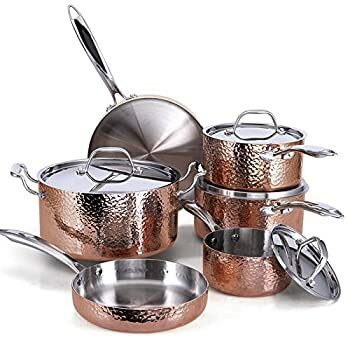 Because other cookware cleaning techniques like scouring or washing in a dishwasher can remove or damage the seasoning on a bare cast-iron pan, these pans should not be cleaned like most other cookware. Some chefs encourage never cleaning cast-iron pans at all; simply wiping them out after use, or washing them with hot water and a stiff brush. 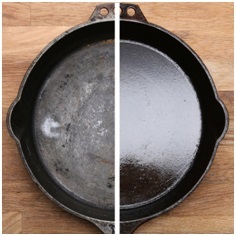 Other cast-iron users support washing with mild soap and water, and then reapplying a thin layer of fat or oil. A third approach is to scrub with coarse salt and a clean rag or sponge. I use a half of a raw potato to do this for ease and handling. When out camping with your camping tent and ice chest for cold drinks, take your cast-iron cookware along to use over an open firepit flame or on a propane grill. Take the dog too! How to Restore Rusty Cast-Iron by Lodge® video. The Lodge® best cast-iron cookware has been made in South Pittsburg, Tennessee, USA, population only 3300, since 1896. It is a family owned company from 1896 to now for over 120 years. 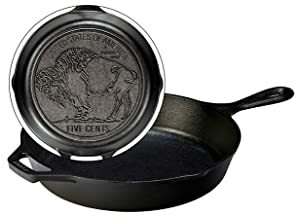 The model number L8SK3BN is a #1 best-selling skillet on Amazon.com® with its collectible iconic frying pan with the cast relief 5¢ buffalo nickel on the bottom. I love this bottom design and it’s my favorite and best cast-iron skillet that’s affordable. See the various sizes on Amazon of 3.5-inch mini great for crispy-edged individual burgers, 8-, 9-, 10.25-, 12-, 12-inch Boy Scout, 13.25,- and 15-inch. Get some of each size for different purposes. Being foundry pre-seasoned cast-iron cookware, you can start using it when you get it. It’s great on campfires too as well as all cooking surfaces and grills. Like all cast-iron, it goes into the oven for delicious flaky biscuits, cakes, and more. Sauté©, sear, fry, bake, and stir fry to your hearts™ content, says Lodge®. Stir fry veggies, make bacon, sausage, or ham and eggs over the open campfire flame and at home. And it’s easy to keep clean. The 10.25-inch skillet does not come with a lid; however, a splash guard works well or a lid from another item you have. 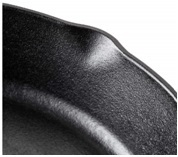 This Lodge® seasoned cast-iron will help your cookware last a lifetime. If you do nothing else, hand wash. Dry immediately—even before your first use and rub with a light coating of vegetable oil after every wash.
Use enough oil to restore the sheen, without being sticky. The reason is to keep the iron seasoned and protected from moisture that can cause rust to form. If you need a larger size, go up one size. The dimensions for the 6-inch are the top outside is exactly 6-3/8-inches, a tad short of 6-1/2-inches, not including the pouring spouts. The bottom is 5-1/4-inches. 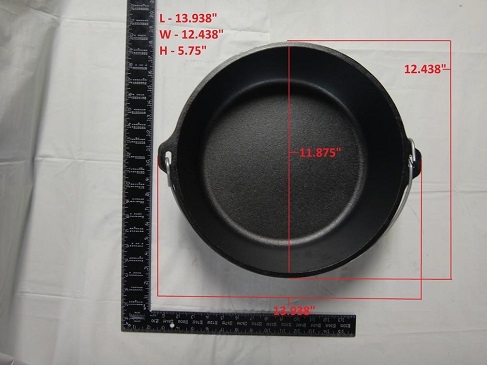 The 10.25-inch skillet weighs about 5-pounds. There is not a written Warranty for Lodge® cast-iron cookware; however, they do stand behind every product they manufacture. For product problems, please contact Lodge® Customer Care and they will solve the problem to your satisfaction or contact Amazon. How to Clean Lodge® Cast-Iron Skillets video. 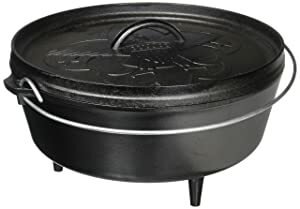 The Lodge® model L12CO3BS pre-seasoned Dutch oven, also made in Tennessee, USA, is seasoned with oil at the manufacturing plant for food to easily release improving flavors after using a few times. The 12-inch 6-quart cast-iron Dutch oven holds a large amount of food. Lodge® cast-iron is a favorite by most cast-iron lovers. 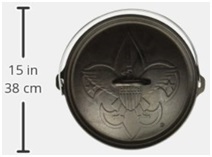 It is officially licensed by the Boy Scouts of America® and the camp oven includes a custom engraved cover with the Boy Scouts emblem. It’s easy to care for by hand washing, drying, and rubbing with cooking oil. This Dutch oven will braise, simmer, sear, fry, and bake over a camp fire, on top of the stove, and in the oven. Use it at your camping area, fishing hole, or anywhere an open fire is allowed, or over charcoal. 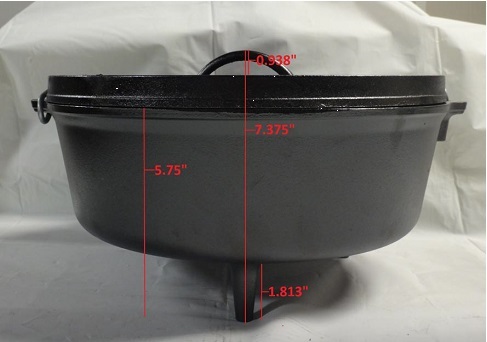 The lid with handle is included and the dimensions are shown below for where you want your Dutch oven to be used then stored. You can use the flanged lid to hold briquettes or charcoal. With the legs on the bottom, you can actually put the Dutch oven in the fire. Use it in your cooking stove oven by sitting the 3 feet on a cookie sheet. It weighs 18.7-pounds with the lid. 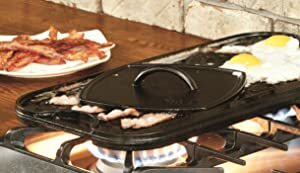 Another cool thing about the lid is that it can be turned over to use the inside as a griddle for pancakes or burgers. Use the bail handle with a tripod over the fire too. 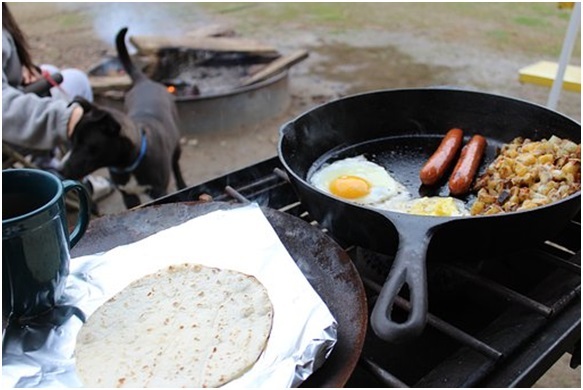 Included with your purchase is the Camp Dutch Oven Cooking 101, a 56-page illustrated guide. The pot is made in the USA. There is not a written Warranty for Lodge® cast-iron cookware; however, they do stand behind every product they manufacture. For product problems, please contact Lodge® Customer Care and they will solve the problem to your satisfaction or contact Amazon. Dutch Oven Cooking for Beginners video. How to Clean Lodge® Cast-Iron demo video. The Lodge® tote bag lets you conveniently carry the Dutch oven with you when camping out. It is the best tote bag for Lodge® Dutch ovens with a padded bottom and carrying handles. 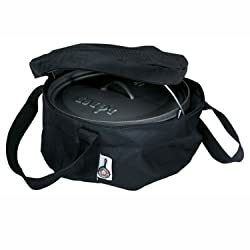 The item model number A1-12 on Amazon.com® folds down over the pot’s handle and you zip the top closed with its heavy-duty self-healing zipper. The tote is round, not oblong to fit your Dutch oven. It weighs 9.6-ounces. 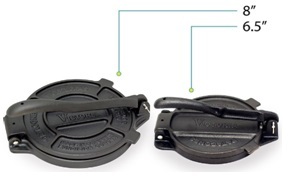 It will fit 8-, 10-, 12-, and 14-inch Lodge® Dutch ovens. 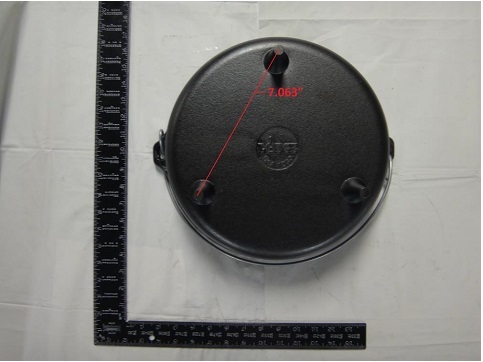 You can also purchase separate totes for individual sizes of 8-, 10, 12-, and 14-inch Dutch ovens. It is a good idea to put the lid on the bottom with the feet at the top end so that the feet don’t wear out the bottom fabric over time. A 1/4- to 3/8-inch thick 10-inch square piece of plywood on the bottom could be made for the bottom for the legs to sit on. This is not made with asbestos so a hot pot should never be put into it. The Lodge® manufacturing company founded in 1896 by Joseph Lodge, is one of America’s oldest cookware companies in continuous operation today. It is still owned and managed by the descendants of the Lodge family. Most cast-iron sold by Lodge® is produced in its foundry in South Pittsburg, Tennessee, USA, still in operation since the company was founded. 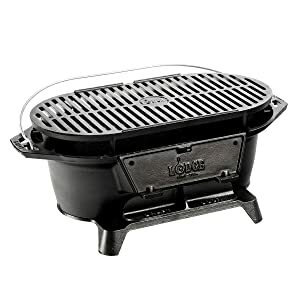 The large charcoal model number L410 shown on Amazon.com® is the Lodge® hibachi-style grill for picnics, tailgating, camping, or patio with 2 adjustable heights is just the item you need when you cannot have an open flame. It has a draft door on the front that regulates heat. Coals are accessible behind a flip-down door. 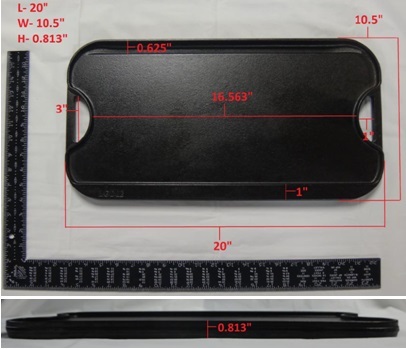 The dimensions are 19-inches wide x 8.2-inches front-to-back x 10.2-inches tall and weighs about 27-pounds. You can use charcoal, wood, lump hardwood charcoal, or briquettes for your fuel. Some assembly is required—and it’s simple to do. You need to attach the base with the 2 screws included. 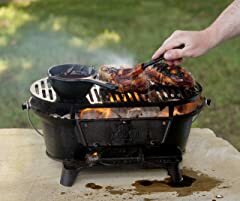 This self-contained grill works great for everything from steak, burgers, pork loin, chicken, beef whether bones are in or out. Do not use this grill in the house or inside your camping tent! The fumes can kill you from any type of fuel. It does not come with a lid; use a pot to cover a food item. It does come with a wire bale. If you’d like this dipping pot for keeping your dipping sauces hot, it too is pre-seasoned at the factory. See #5 below to purchase. It can also be used for your basting sauce. How to Cook Burgers on the Lodge® Sportsman’s Grill video. Two-pound Ribeye on a Lodge® Sportsman’s Grill video. 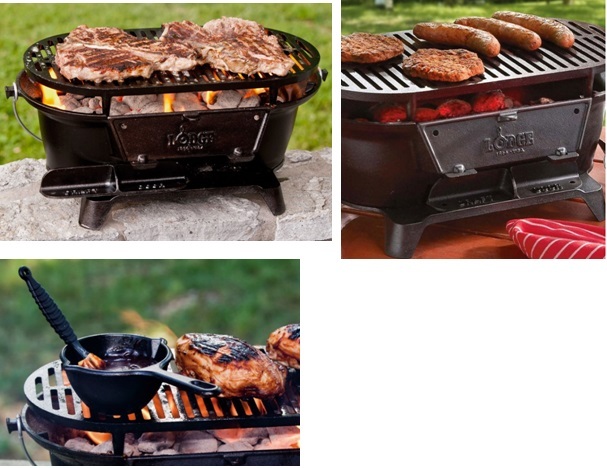 The Lodge® item LMP3 cast-iron dipping, basting, or melting pot is the perfect accessory when grilling on the Sportsman’s grill or any grill. It’s affordable and sold on Amazon.com® to add to your purchase to arrive at the same time for summer fun. I love it because it’s heavy, pre-seasoned, easy to clean, and keeps the sauce hot. You cannot put glass or plastic on a grill, so this is the ideal choice for the task at hand. Melt butter and chocolate; however, the little pot is not large enough to make soups. This small godsend is safe to use on the stove, in the oven, and campfires. It will not stick, has a cast-iron handle with loop for hanging, and a pouring spout for no drips. Hand wash as you do with all cast-iron cookware. The dimensions are 9.313-inches long x 5.438-inches wide x 2.875-inches tall and weighs about 1.5-pounds. Of course, Lodge® is made in the USA. There is not a written Warranty for Lodge® cast-iron cookware; however, they do stand behind every product they manufacture. For product problems, please contact Lodge® Customer Care and they will solve the problem to your satisfaction or contact Amazon. Lodge® Cast-Iron Sauce Pan video. American Skillet Company™ skillets are made in the USA and are heirloom quality. 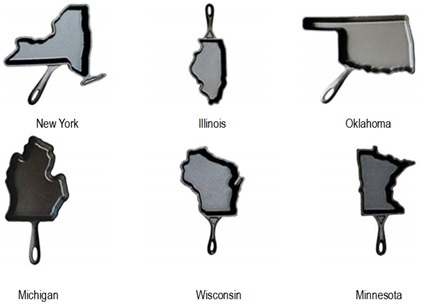 What is more clever than a skillet made in your state’s geographic pattern? All skillets are ready to use, individually hand-finished and pre-seasoned when you get them. Comparable to vintage cast-iron cookware, cast-iron always gets better and better over time and use. It’s the best! All skillets are commercially manufactured in Wisconsin, and hand-seasoned with organic flax oil at the American Skillet Company™ headquarters in Madison, Wisconsin. The Texas skillet holds approximately 3.5-cups of food with a 5-inch-long handle and a cooking area of approximately 10.5-inches long x 10-inches high x 1.5-inches deep and weighs about 6-pounds. 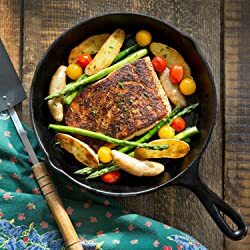 American Skillet Company™ cookware has been featured on The Martha Stewart Show, The Chew, HGTV, The New York Times, Gourmet Insider, The Huffington Post, Wisconsin Foodie, and Food & Wine Magazine. Your Lone Star State centerpiece at your next potluck, tailgating party, holiday celebration, or dinner party will be the talk of the crowd! Get the state for your friends and surprise them with this ingenious gift. 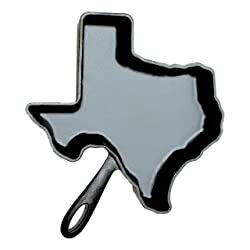 You already know how to make the best crispy-edged corn bread, brisket, pot pies, biscuits, upside-down cakes, and cobblers, so now you can kick it up a level by baking and serving your favorite dishes in this unique and beautiful Texas-shaped skillet or another state-shaped skillet. Fancy gift-wrapping is available and a magnet for hanging is a useful accessory. The skillet ships inside a gift box including recipes and cast-iron care cards. Again, the skillets are made in Madison, Wisconsin, USA. The Chew TV show—American Skillet Company™ video. The Simple Chef® cast-iron skillets are affordable on Amazon.com® for the 3 skillet sizes of 6-, 8-, and 10-inch sizes. These are for home and/or restaurant use made of heavy-duty professional chef quality cast-iron. The item number is Simple Chef and the ASIN is B01FSPRME8. All skillets in the set are factory pre-seasoned and are great for sautéing, frying, cooking, grilling, and creating pizza baked right in your own oven! The large cast-iron skillet is wonderful for frying a crispy tender whole chicken cut up. Every cook must have a cast-iron skillet for the crispy fried chicken and fish it does well. Cast-iron lasts forever and these skillets are ready to use right out of the box. This is one of the best cast-iron cookware sets available today. These conduct heat well and hold that heat so your food is always served piping hot. 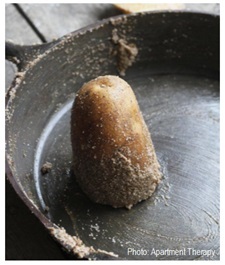 Use over a campfire or any cookstove cook top surface. Store the skillets in a cupboard nested or hang by the hole in the handle. The pouring lip on each side keeps drips off counters and the bottom of the skillet. You will receive a 30-day money back guarantee if you are not completely satisfied and receive a full refund. The cookware is designed in the USA and made in China. How to Make a Panini in a Cast-Iron Skillet video. 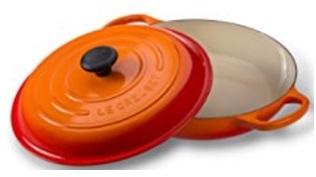 LE CREUSET® of America has been making cookware for over a century. 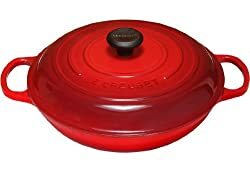 The oval cherry red (cerise) braiser model number LS2532-3267 is a best seller on Amazon.com® and is affordable being made of cast-iron with enamel on top and on the interior. It’s oval and not round-shaped available in 3.5- and 3.75-quarts for those with smaller families. The fun colors to go with your kitchen décor are fabulous! The enameled cast-iron braiser is uniquely designed for maximum performance, transforming tough cuts of meat and hearty vegetables into tender, flavorful dishes. Food is first seared over high heat, then finished slowly in a flavorful liquid. The wide base of the braiser allows ingredients to be placed in a single layer for proper searing; once liquid is added, the domed lid continuously circulates steam to lock in moisture and flavor. LE CREUSET® produced the first enameled cast-iron cookware nearly a century ago, and the original foundry still operates today, where 15 skilled artisans hand-inspect each piece. 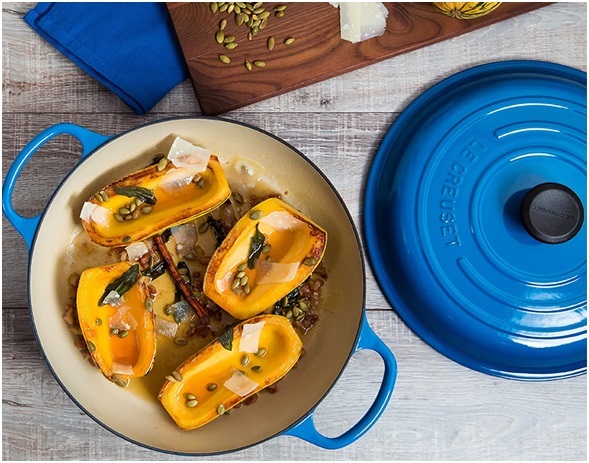 This tradition of the finest culinary craftsmanship, combined with the latest innovations in comfort and functionality, make LE CREUSET® unsurpassed in both beauty and quality. The exterior enamel is shock-resistant to prevent chipping and cracking and the sand colored interior enamel has a smooth finish that promotes caramelization, prevents sticking, and resists stains. With the dome-shaped lid, flavor is locked in with its continuous circulation of heat and moisture. The wide-loop handles are comfortable to grip and are safe. The black phenolic knob or stainless-steel knob is oven-safe up to 500-degrees F. No seasoning is needed with the enamel over cast-iron interior. Use the braiser on ceramic, electric, gas, halogen, vitro-ceramic glass, induction, outdoor grill, and electric and gas ovens. It is dishwasher safe. When using any glass-topped stove or any stove, always lift this best cast-iron pan when moving it; never slide it, as this may damage the stovetop or the base of the pan. The dimensions for the 5-quart capacity braiser is 13-inches diameters x 5.75-inches tall x 16.5-inches wide. Gift-wrapping is available for someone you love. You’ll receive a User’s Manual and the braiser is made in France. LE CREUSET® Use and Care video. LE CREUSET® A Chef’s Life How-To’s with Chef Vivian Howard – Braise. 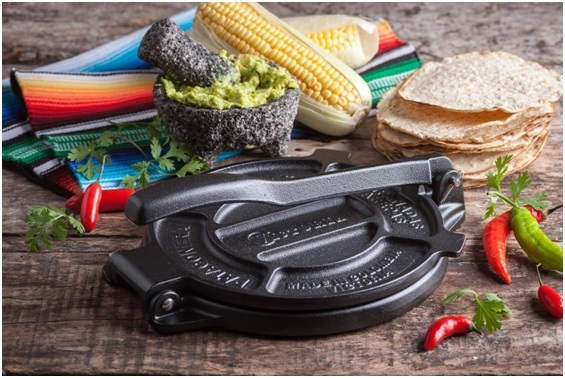 The Victoria® cast-iron tortilla press is super heavy-duty for uniform pressing of the soft masa harina (corn) or flour dough with an improved handle and base for no struggling when pressing down. It’s also available in 6.5-inch. The model number TOR-003 shown on Amazon.com® is a best seller for it’s hefty weight when pressing down. Cast-iron is so much better than an aluminum press. 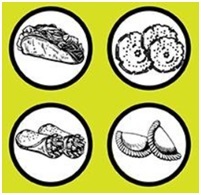 For non-Latin users, a pataconera is a metal press consisting of a fixed base and a movable top with a lever compression handle used to form corn tortillas from soft masa, also known as the tortilla press. Patacones or tostones are made from green plantains peeled and cut cross-wise. Patacones are fried twice and are served in restaurants all over Colombia as a side dish for fish dishes or as an appetizer with guacamole, hogao (tomato and onion sauce), or ají (hot salsa). 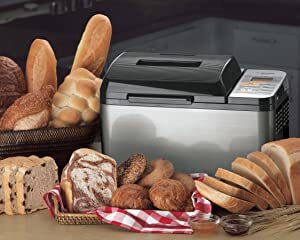 You can also make empanadas, arepas, dumplings, mini pie shells, patacon pisao, flat bread (rotis), and more with this affordable press that will last a lifetime passing it on to your family. Tortillas are not the only thing you’ll love home-making from scratch! Cook them in your cast-iron fry pan for a delicious flavor that’s not found in a pre-packed box of tortillas! Do not cook your tortillas on the press! The Victoria® press is pre-seasoned with 100% non-GMO flaxseed oil and is low maintenance for caring for it. The oil used for seasoning is certified Kosher. It has certification: Kasher Parve by Vaad HaKashrut de Bogotá. This is the tortilladora that has been cast in Colombia since 1939, a three-generation family company that makes the best! 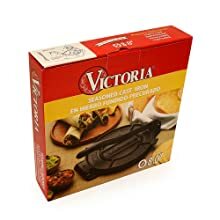 This press is authentic made by the ORIGINAL Victoria®. Don’t settle for flimsy poorly made imitations; you won’t be happy with the outcome. The overall dimensions are side-to-side 11.25-inches and the overall depth front-to-back is 11-inches. This is a manual press where you use your hand; it is not electric! It weighs 9.5-pounds and you need that weight for it to make flat tortillas. You will get an extra screw for the lever and a User’s Manual with detailed instructions for how to use and care for the press. For instance, if you want super thin tortillas, after pressing, use a rolling pin. Gift-wrapping is available for your tortilla-loving friends and family. You will receive a Limited Lifetime Warranty that covers any manufacturing defect. If for any reason it breaks or gets damaged under normal use, it will be replaced. It does not cover wear or misuse. More details are in the packaging. The Victoria® press is made in the country of Colombia. Gluten-free Corn Tortilla Making video. The Lodge® brand is the best-selling cast-iron company made in the USA. 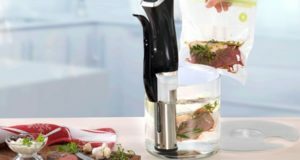 Amazon’s Choice is this buyer’s favorite pick as well for the model LPGI3 that flips over for what you want to cook. The Lodge® Reversible Pro Grid Iron Grill and Griddle provides excellent heat retention and distribution and fits over two stovetop burners. Two easy grip handles allow for easy lifting, flipping, or hanging when not in use. You can use this grill to cook pancakes and eggs or grill chicken, steak, burgers, and more. It comes to you pre-seasoned with 100% pure vegetable oil with no chemicals or synthetic coatings. The seasoning gets better the more you use this product. This grill is reversible, not 2 separate pieces. The picture shows you both sides. 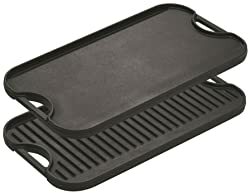 Use this reversible grill/griddle at home in the oven, on the stove, on the grill or over the campfire. Professional chefs love it too! Make grilled cheese on the flat side—and did you know, kids love grilled peanut butter sandwiches! My mom made those for us kids with a tad of honey on top and grilled them to perfection. Even though the cookware comes pre-seasoned to prevent food from sticking, it works best when sprayed or lightly coated with vegetable oil before using the first time. To fit your 2 stovetop burners, check the size before you buy. Use on electric, gas, ceramic, in the oven, or on the grill. You cannot use on all models of induction stoves. The surface must be super flat! On glass or ceramic cooktops, lift cookware; never slide it. It works beautifully on propane gas stoves when camping or an open fire. The grill weighs about 13-pounds. Never ever put cast-iron in the microwave! Never wash in the dishwaser. 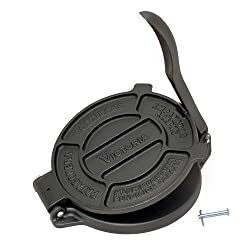 The Lodge® Rectangular Cast-iron Grill Press 6.75- x 4.5-inches with cool-grip spiral handle is handy in different shapes if you need one to hold your bacon flat. It weighs 2.12-ounces to hold your meat to be seared down nicely. Some assembly of the screws is to be done. Lodge® Pro Grid Cast-Iron Grill/Griddle demo video. Quick Tip: Cleaning Cast-iron with Grates demo video. Never ever put cast-iron in the microwave. Never clean in the dishwasher. See the User’s Manual for cleaning instructions before using the first time. Cast-iron can be used on all cooktop surfaces: glass cooktops, gas, ceramic, electric, induction, in the oven and even open fire cooking and the grill. Handles on cast-iron get very hot, so use a pot holder, such as these that fit snugly over the handle—my favorite. They are machine washable. See the Lodge® Striped Hot Handle Holders that are inexpensive and so handy for all cookware with handles.They are designed to fit on Lodge® traditional-style handles to protect hands from heat up to 350-degrees Fahrenheit and measure 6-inches long x 3-inches wide. These can be used on other cookware brand handles too. Cook with butter, palm oil, flaxseed oil, coconut, canola, Crisco® and others. Correct cleaning and seasoning will make your cookware with time more non-stick for your cooking. Do not cook acid foods that weaken the seasoning of your cookware until it is well seasoned from using with other foods first. Food might stick the first few times you use your cookware so use extra oil until it becomes stick-free from a good seasoning over time. Do not slide cookware on glass or ceramic cook stoves to eliminate scratching of the stove’s surface. 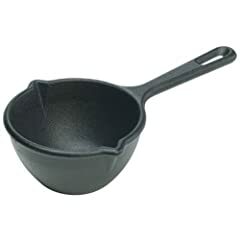 Cast-iron is sand molded and each piece of cookware is unique to mean you will see irregularities that does not have an effect on the cookware or its use. Last night I made crispy on the outside salmon patties from salmon in a can using an egg and cracker crumbs. I used Smart Balance® cooking oil, a blend of vegetable oils (soybean, canola, and olive oils). The patties did not stick! Today I will clean and re-season my cast-iron skillet and store it away. Let us know your favorite things to cook in cast-iron, your comments or questions in the comments box below. Happy cooking with your new cast-iron cookware now and forever!